Some places in the Maldives just have that effect…you know, the kind of place you start to miss while you’re still there. Some places drift back into your mind as you’re dodging vehicular terrorists on the Addu link road, or when you’re sidling past another construction site in Male’. Okay, we’ve gotta keep a bit of a lid on this thing as we want to write nice things about every island we go to, but Dhanbidhoo just makes you feel sort of like (damn it, there we go again…). Right [splash of cold water, clears throat]. Dhanbidhoo was another island we went to armed with, despite our best efforts, only a few pieces of information. 1. 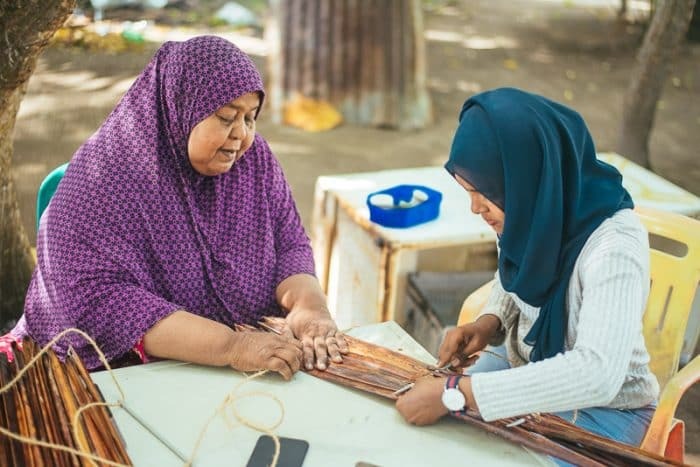 Dhanbidhoo was home to the 12th century copper-plate grants, the Dhanbidhoo loamaafaanu, which when translated in the 1980s showed the island did not convert to Islam until some 40 years after Male’. 2. 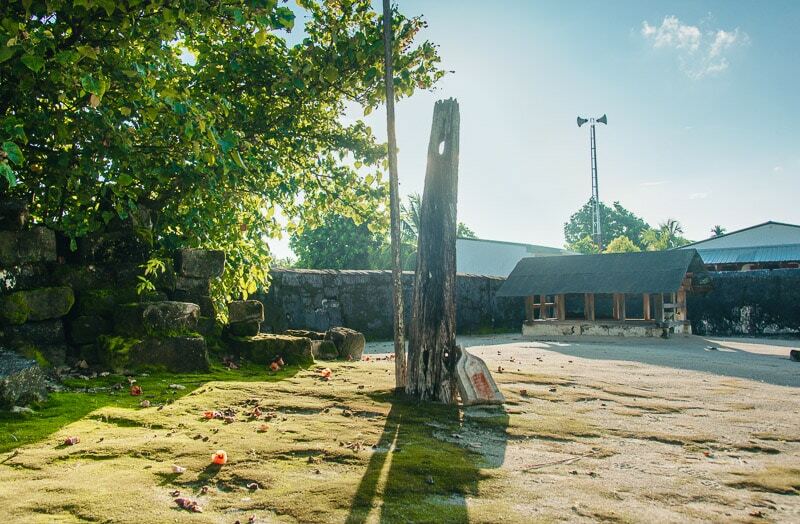 Dhanbidhoo has/had two pre-Islamic stupas, known locally as the Bodu Budhu Koalu and the Kuda Budhu Koalu. 3. H.C.P. Bell noted in 1922 that Dhanbidhoo was unusual in having a ‘furedda odi‘ which could trade the breadth of the Indian Ocean (and he was well impressed). 4. Dan and Naj knew only points 1-3. So, with these rather-dated set of facts we arrived on Monday afternoon to get some new ones, and were soon welcomed in by friends (and friends of friends) we recently made in Gan. After being shown our room and lent a bike (see point 5), we padded out into the soft streets and softer evening sun to see what else we could know about Dhanbidhoo. Within minutes we found ourselves engrossed in the story of one of the most interesting ziyaaraiy we’ve seen. While the details of the person inside were scant – probably a man named Ibrahim from the long since depopulated island of Fushi – the grave itself has led quite a full life, witnessing years of sick children being weighed with bananas (we will try to write more about this), and then surviving the 2004 tsunami, though the surrounding wall didn’t. Both wall, scales and Ibrahim, even in their dilapidated condition, remain. Before we could calculate how many bananas a sick child weighs, we had been led to the northern end of the island, into the farming area, in which stands just under six feet tall. Is that bodu or kuda…the other one seemed to get by us this visit (see half of point 2). After an evening of great food and joali chats with sage island elders (see point 5), Naj took a lesson in the craze that is sweeping, not just Dhanbidhoo, but the surrounding islands too. Signs of this trend can be seen in wheelbarrows trundling up and down the islands, propped up outside houses, and in the busy hands of most of the people we talked with during our stay. Fangiviyun, or palm thatching has obviously been a traditional activity, but demand (mostly from resorts) for this rustic roofing appears to have rocketed again in recent years. The rest of our only full day in Dhanbidhoo was actually spent next door in the island of Hulhiyandhoo. 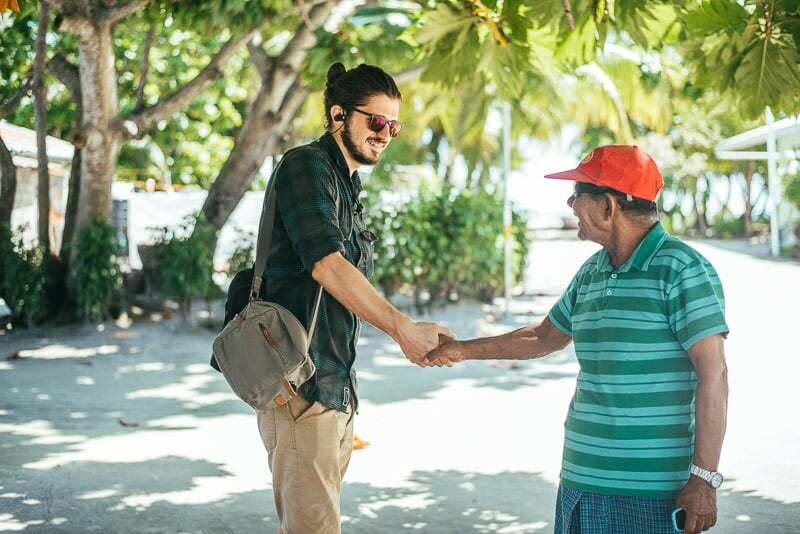 Despite being depopulated in the early 1950s (we met some of its migrants in Kalaidhoo), the island’s Bodu Magu is still well-tended by the current lease-holders. 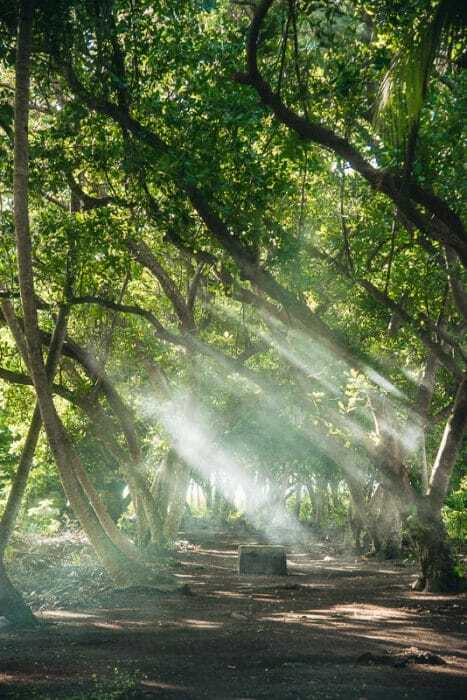 This lends a ghostly air to the place, which is greatly added to by the extensive valu gaburustan, or jungle graveyard, a little further off the main road. On the way back we collected kudhu anga – some kind of little shellfish – and ate them with pasta that night. All told, we’re not sure this augmented list from our short stay is going to change the way history remembers this small island, but it’s definitely going to keep us dreaming little dreams of Dhanbidhoo.